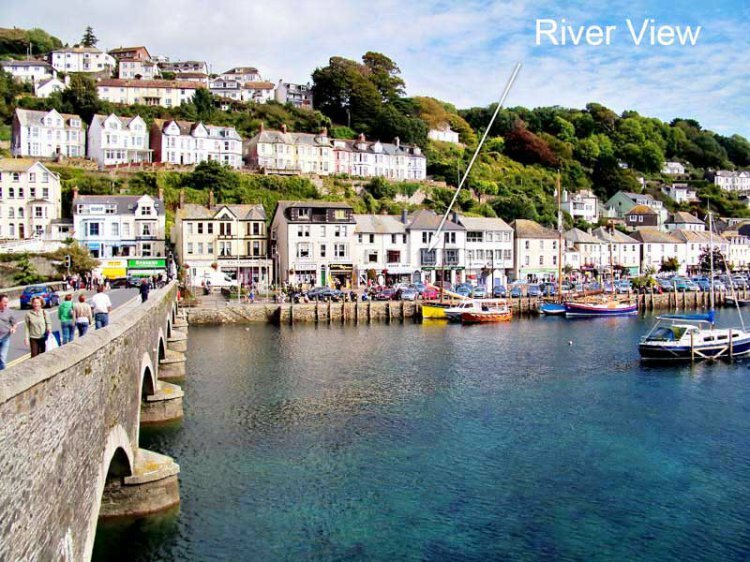 'River View' in Looe, is set practically on the river that serves as the landing quay for the fishing boats and pleasure craft that use this popular Cornish holiday town. With a sandy beach just a short walk away and all the delights of a Cornish fishing village on your doorstep, 'River View' is a delightful place to soak up the local charm. Entered via a flight of internal stairs to the first floor and into the entance hall. The quality is immediately apparent, this property has been independently inspected by 'Quality in Tourism' and achieved a Four Star rating. The modern living area has a fully equipped kitchen with electric oven, ceramic hob, microwave, dishwasher, fridge freezer and washer/dryer while a breakfast table and chairs provide ample dining space. The lounge area has stunning views out of the bay window to the quay and the river beyond. A comfortable sofa is complemented by a padded window seat which provides a great spot to sit, read and watch the world (and the tide) go by outside. There is also a wall-mounted LCD TV with DVD player and freeview. A CD player and iPod docking station are also included. The double bedroom has a double bed, bedside tables and lamps, plenty of hanging and drawer space and a dressing table, all from quality solid wood. A modern luxurious bathroom has a bath with power shower over and a matching toilet and handbasin. Car parking is available a 4-5 minute walk away at a cost of £38.50 per week (subject to change) which is payable over the phone when parking. You can unload immediately outside the property or in a pay and display short stay car park just opposite. Full details for long stay car park are available inside. Rental includes central heating, electricity, WIFI, bedlinen and towels. Regret no smoking and no pets. NO BABIES OR CHILDREN.